We’re Justin and Olivia. Justin’s a web developer from Newfoundland that does the driving and mechanical stuff and handles all the back-end elements of our website. Olivia is a graphic designer from Toronto that does the navigating and cooking while writing all the content on our website. That being said, we work together on pretty much everything and overlap all the time. We see ourselves as the “generic version” of what the world has come to know as #vanlife. We don’t have a fancy Sprinter, we’re not photographers and we sure as hell aren’t vegans. We don’t fit the mould of the stereotypical vanlifer because we’re just regular beer-drinking folks that aren’t buying into the overly glamorized BS. Would you recommend opting for an older van? What’s the gas mileage like? We LOVE having an older van. Some might scoff at the fact that our van was already converted (cause they’re turds) but it was much easier and cheaper to get started. Also, having a good heater was really important for us since we’re in Canada so having a professionally installed propane furnace has been a life saver. Because these older vans were so widely produced, parts are easy to find and we can do most, if not all, of the mechanical work ourselves (with a little help from YouTube). Our gas mileage is straight up garbage. No sugar coating, it blows. That being said, we had to do a repair a while back that changed our gear ratio so that only made mileage worse. We’ll get anywhere from 4-5km/L or 9-12 mpg and usually get about 500 km or 310 miles to a tank. Do you live in the van full-time or just use it for weekend trips? We have been completely full-time since December 2017. We have a few sentimental items at our parents’ houses but other than that, our entire lives are in our van (don’t rob us). We run a web development company called Keep the Internet Busy. We make websites, design logos and do marketing and all that good stuff. This means that as long as we have electricity and internet, we can work. We aren’t tied to set hours so it gives us a lot of flexibility while travelling. Sometimes we tether off our phones and sometimes we go the coffee shop route and leech off of other people’s wifi. Gotta love #FreeWiFi. How do you maintain an address for mail and government stuff? We rent a mailbox in a print shop so we have a suite address. This reads like a business address so we have no trouble getting mail or packages compared to having a P.O. box. While travelling in the US, we use USPS’ General Delivery system. It’s super easy as long as you confirm that the post office you want things sent to actually does GD (always call, the website lies) and then all you have to show is ID to pick it up! Canada Post also offers FlexDelivery, which is basically a temporary P.O. box for free – perfect for Amazon packages. How do you find camping spots? Quite simply, lots of research. We love websites like www.freecampsites.net but it’s massively under utilized in Canada so we’ve had to get down and dirty with provincial resources on our own. Hence why we’ve created our own Camping Directory that we’ll be continuously updating as we travel and discover new spots. Talking to locals is another great way to find some intriguing lesser-known places to check out. Heck, sometimes we see a cool spot, give it a whirl and just hope no one kicks us out – trailblazin’! Do you have an end destination? Nope! We plan very vaguely then fill in the gaps as we go. Did you have any mechanical experience before starting? How about travelling experience? Little to none. Justin had dabbled in a few basic things like changing tires and jump starting batteries but Olivia had never even owned a car before. Armed with a Haynes manual, we’ve been able to repair almost everything that didn’t require special gear on our own. In terms of travelling, Justin is a musician that has toured Canada with bands for years. He’s driven across Canada 13 times and counting. Olivia lived overseas for a while in Holland and has spent any and all of her money on travelling outside of North America. 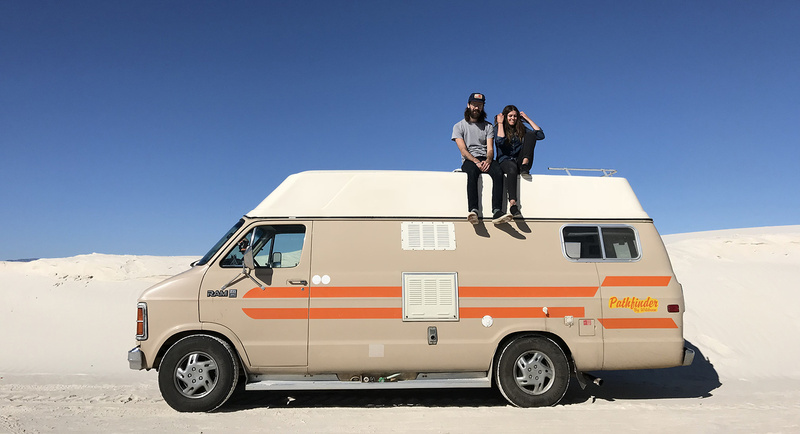 Are you actually saving money by living in a van? Definitely. We were living in Toronto where rent and life in general is exceptionally expensive. We spend less on food because we eat out less and we certainly don’t spend the equivalent of our former rent money on gas and insurance. Olivia is a member at Planet Fitness so for $20 CAD/mth, we can both shower to our hearts’ content. There are locations all over America and more are slowly starting to pop up in Canada too. We’ll also use showers at public pools or recreation centres and a truck stop here and there too. For other times, we’ve got a portable solar shower that does the trick and of course, baby wipes. Lots of baby wipes. In a hole in the ground, in a bag (that we throw into a trash can immediately) or at a gas station. It’s not pretty but it’s the sacrifice you make when you get to travel with your home to really cool places all the time so… get over it. What are your monthly expenses like? Since being on the road, we’ve made it a point to keep track of all of our spending in an Excel sheet, which has become pretty valuable insight. We have a few fixed expenses like cell phone bills, gym membership and car insurance but how much we spend on other things is fairly flexible. Gas is obviously our main expense so if we’ve got cash to spend, we can boot around a bunch and to save money, we can just stay in one spot for longer. Ever since installing solar, we’ve basically been able to eliminate lodging costs for campgrounds or RV Parks completely so that has been a game changer. Food is food; we love it and we treat ourselves once in a while, especially if we’re in a city. Olivia is extremely thrifty (read: cheap) so splashing out here and there is definitely warranted. It’s super important to always have some money in the bank because you never know what repairs might come up – some months we’ve spent $1000 on the van and others we’ve spent $0. Do you guys often want to kill each other from being in such close quarters all the time? Short answer: surprisingly no. It takes some getting used to but our van has a pretty good flow that never feels too cramped; sometimes one of us will sit in the driving area and the other will sit on the bed and it feels like we’re in different rooms. We’re also outside A LOT so it’s not like we’re spending the whole day cooped up in the van. As long as we can. What’s the best investment you’ve made into your van? Biggest regret? That’s a no brainer – installing a solar system was the best decision we’ve ever made. Regrets are few and far between but when renovating the van, we painted the interior with latex paint, which held up nicely for about an hour. Way too easy to scuff in such a small space and not at all easy to clean. What’s your favourite place been so far? Probably White Sands National Monument in New Mexico. It’s incredibly beautiful and felt absolutely surreal. If you’ve been, you’ll understand; if you haven’t, you’ll just have to go. What’s one piece of advice you would give to a prospective vanlifer? Don’t let anyone write your van story. Not everyone sits in their perfectly manicured VW bus wearing a flower crown while playing the ukulele (no one does) like it appears on Instagram. Find the van and layout that works for you and follow whatever trails give your life fulfillment. Don’t feel like you all of a sudden need to be vegan and be into yoga because it’s not a package deal. Inquiring minds still want to know more? Give us a shout!